Hello friends! I’m inviting you to join me for yet another Spellbinders project and video. This time I am using beautiful dies from Amazing Paper Grace for Spellbinders. 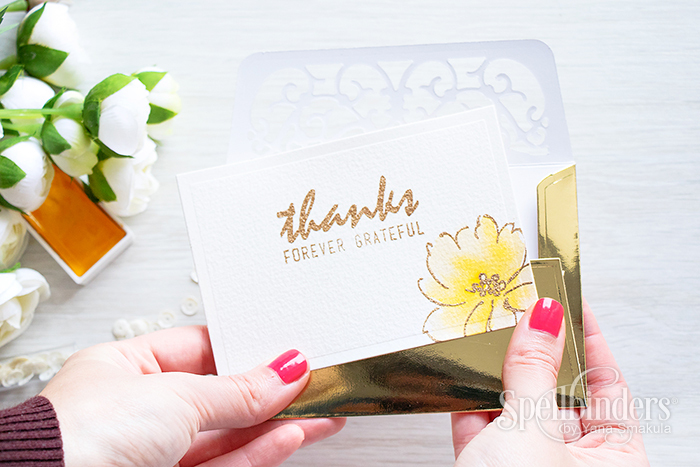 Becca Feeken, the talent behind Amazing Paper Grace is one of my favorite die and card designers and she probably is the one who inspires me most when it comes to crafting with my Spellbinders dies. So naturally, dies designed by her are among my absolute favorites. The die that I am using for my project today, Card, Enevelope and Liner Set, is a part of a Wedding Die Collection. 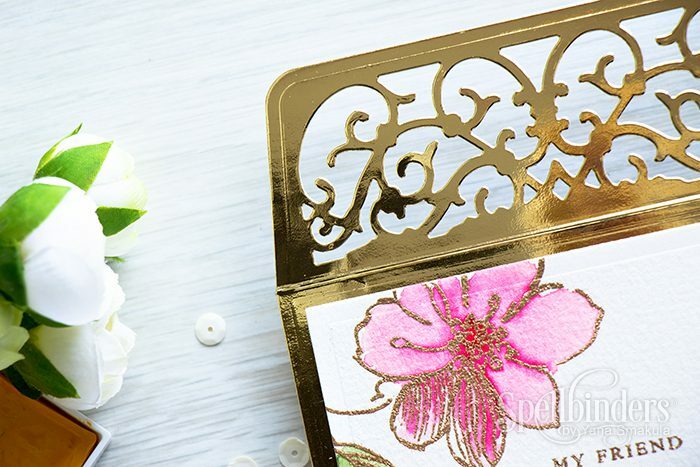 There are a number of stunning examples suitable for weddings on Spellbinders’ website, you can also check out this video from CHA Show where Becca talks about her line and shares many gorgeous samples. I wanted to use this die for a different occasion just to show you the versatility of this product. You don’t have to use it for a Wedding, it will work for a simple Thank You like I have here, or a Baby Announcement, or as a Gift Card holder or anything else really. Because I am such a fan of gold I couldn’t resist using Gold Mirror Cardstock for my project. I die cut the envelope, scored, folded and adhered the flaps. To decorate it I die cut the card die twice. 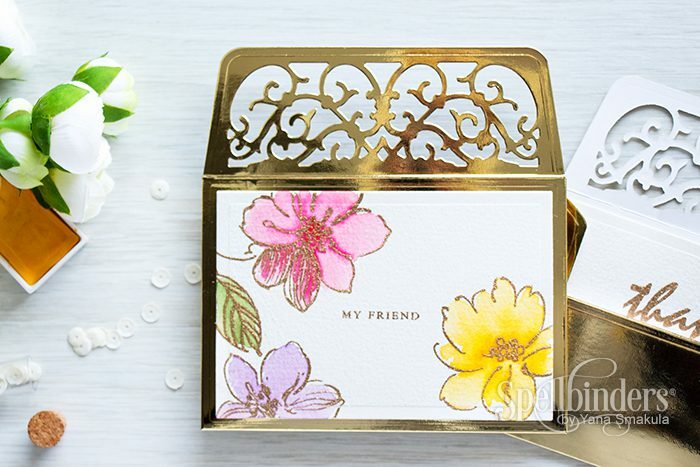 Using gold embossing powder I heat set “My Friend” and several wild flowers and loosely watercolored them. The second card was also decorated in a similar way, although I left a lot of blank space to white a personalized message. This die set offers a lot of possibilities – you also have a die to create a matching envelope liner and even an element to decorate the outside of the envelope or the card. If you are looking for an envelope die – this one is a great to have. Although, please note, this is not an envelope die for an A2 card, its smaller. Wow! These sets are amazing! So elegant and gorgeous!